The wheel from the Cornelia B. Windiate. The Windiate is a three-masted schooner that sank in 1875 in 185 feet (56 m) of water off Presque Isle, Michigan, in Lake Huron. Photo taken during the August, 2003, archaeological survey organized by Joyce Hayward. The baseline measuring tape reel is visible hanging off the wheel. Photo taken by survey participant Rod Maxson. 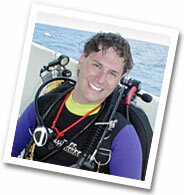 Divers and friends, welcome to my web site. I hope you find it both interesting and useful. It is about diving in the Great Lakes of North America, which is some of the best wreck diving in the world. The cold fresh waters of the Great Lakes preserve the wood, metal, and cargos of the schooners and steamers that have plied these waters for two hundred years. They are time capsules of life in the 1800's and 1900's, and these remnants of tragedy number in the thousands. They range in depth from one foot to over 1,000 feet (300 m), well beyond any diver's reach. I live in Cleveland, Ohio, USA, on the southern shore of Lake Erie, which is the shallowest of the Great Lakes. It has a maximum depth of 210 feet (64 m), and unlike the other lakes, every square foot of its bottom is accessible to sport divers. Lake Erie has a stormy reputation, and due to its shallow nature, waves can reach frightening and dangerous proportions in a very short time. This has resulted in innumerable shipwrecks, all waiting to be found, explored, and described. To the best of my ability, I have cataloged and described the wrecks I have explored in the Great Lakes, and I will continue to add more material to this site as more shipwrecks are dove.